Born Daniel Dwight Tosh on the 29th May 1975 in Boppard, Rhineland-Palatinate, West Germany, and is a comedian, actor, screenwriter, and producer, best known to the world for his own show “Tosh.0” (2009-2017), aired on Comedy Central, among many other differing achievements. Have you ever wondered how rich Daniel Tosh is, as of late 2017? According to authoritative sources, it has been estimated that Tosh’s net worth is as high as $16 million, an amount earned through his successful career in the world of entertainment, active since the late ‘90s. Although born in West Germany, Daniel spent his childhood in Titusville, Florida, being raised by his Presbyterian minister father. He went to Astronaut High School, from which he matriculated in 1993, after which he enrolled at the University of Central Florida. Daniel finished his studies in 1996 with a degree in marketing. Though realizing he has a talent for comedy immediately after college, Daniel worked at Central Florida Research Park as a telemarketer, but after being tired of the everyday job, Daniel quit and moved to Los Angeles in pursuit of a career as a comedian. However, his first appearance was in Montreal, at the 1998 Just For Laughs, and only after several years of club performing did Daniel made his breakthrough when he appeared in the “Late Show with David Letterman” in 2001, which brought the attention of several other variety show hosts, including Jimmy Kimmel, in whose show he appeared in 2003. The following year he made his first appearance in “The Tonight Show with Jay Leno”, which certainly increased his popularity and wealth. 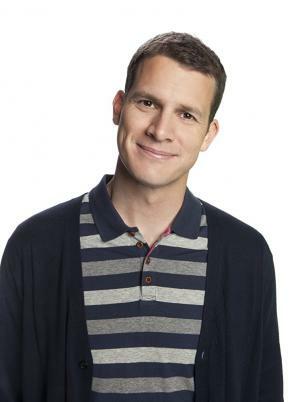 Nevertheless, it wasn’t until 2009 that he became a celebrity, when Comedy Central gave him his own show “Tosh.0”, after a successful TV special in 2007, entitled “Daniel Tosh: Completely Serious”, which he wrote and also produced. Another special followed in 2011 – “Daniel Tosh: Happy Thoughts” – further increasing his net worth. Most recently, Daniel filmed another comedy special “Daniel Tosh: People Pleaser” in 2016. Aside from his work as a comedian, he is also an accomplished actor; back in 1998 he made his debut in a minor role in the TV series “Sins of the City”, while his best-known role is that of Malloy in the TV series “Brickleberry” (2012-2015), while he also had a notable role in Mike Myers’ written film “The Love Guru” in 2008. Regarding his personal life, Daniel was in a relationship with Megan Abrigo from 2009 until 2011. According to recent reports, he is currently single. Regardless, he is something of a philanthropist, including participating in efforts contributing to Alabama disaster relief. As with many comedians or comic actors, Daniel suffers somewhat from anxiety, usually in social environments, but occasionally having an effect on his public performance, and he doesn’t involve himself in public speaking. 1 Bill Hicks is a huge influence. I love him. 2 I really don't work a whole lot as far as touring, but I do stand-up every night of my life, no matter where I am. 4 I grew up in Florida and went to school there, and ended up going to University of Central Florida. 5 It's funny... you can make fun of AIDS or Haiti, but if you make fun of some starlet in Hollywood's looks? That's like the one thing... the line you are not to cross. 6 I go to the dentist every six months, I get a cleaning, so... I'm fortunate enough that those fluoride treatments as a child worked. Not getting any cavities. 7 I have no idea why people want to watch puppets be the slightly meaner version of the weirdo holding them. It's beyond my comprehension. 9 I don't know, maybe I'm immature, but I still find it funny if I dump cold water on my girlfriend when she's in the shower. 10 I don't know why I get away with some things. But I'm not a misogynistic, racist person. Yet I do find those jokes funny, so I say them. And I try to say everything kind of in a good spirit. 11 It's not a stereotype if it's always true. 12 I really don't work a whole lot as far as touring, but I do stand-up every night of my life, no matter where I am. It's really made the touring a lot less grueling. 13 It's the ultimate pinnacle of stand-up to have an hour on HBO, but way more people see Comedy Central, and they've been good to me. 14 The great thing about Los Angeles is that you can get so much money in this town by constantly failing. You can get a lot of television deals that don't go anywhere, but you still get paid. 15 I actually got a part in 'The Love Guru', that Mike Myers film. I heard it's awful. I got a Razzie award for it, which I'm quite proud of, but I still haven't seen it. I have no plans to branch out. 16 [on a girl that he was dating] She says that I always correct her. And I tell her "How do you think it makes me feel, knowing I'm dating someone that's always wrong?" 1 He used to work as a telemarketer before his comedy career took off. 2 His father was a preacher. 3 He has said that he suffers from social anxiety. 4 Attended Astronaut High School in Titusville, Florida. 5 Attended UCF (University of Central Florida).